3LAB's Guide to Luxury Living: ABC NEWS SAYS: NO MORE WINTER SKIN CARE WOES THANKS TO 3LAB! 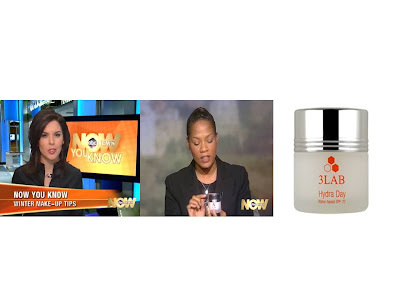 ABC NEWS SAYS: NO MORE WINTER SKIN CARE WOES THANKS TO 3LAB! Thank you ABC News and celebrity make-up artist, Cynde Watson for letting everyone in on the secret to getting the right moisturizer during the dry, winter months; “You really want to look for that hydrating ingredient like the ones in 3LAB’s Hydra Day …so you’re getting that water in your skin,”says Cynde. Hydra Day is a water-based hydrating cream that provides protection from UVA/UBA rays with an SPF of 20. This moisturizer is infused with antioxidants and not only protects the skin against environmental elements such as wind, pollution, and smoke but its light texture goes on smooth without any residue. Make-up Artist Tip: Hydra Day is an excellent, non-comedogenic moisturizer that doubles as a pre-makeup base for all skin types!